Toby Young is considered a dangerous man by many in education but once he starts referring to The Untouchables’ Chicago Way as a personal maxim you have to wonder to what extent his words are just bluster. In this week’s Times Education Supplement I review Toby Young’s new book “How To Set Up A Free School”. 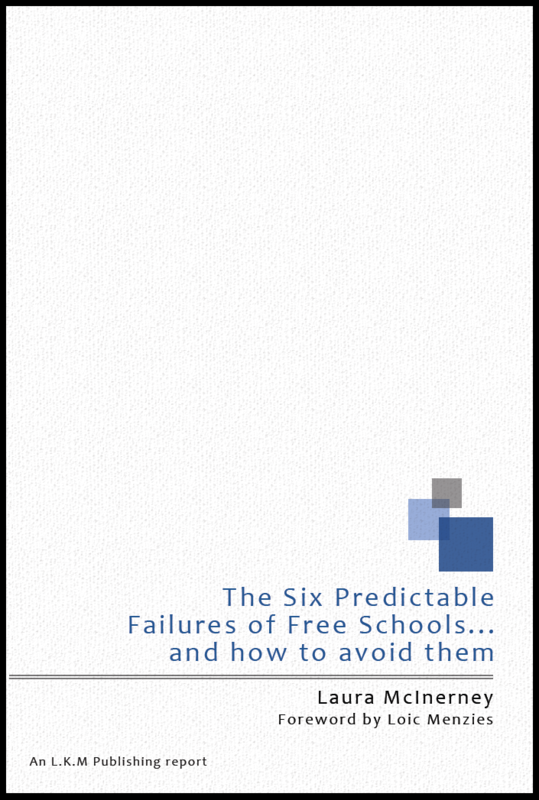 The book is actually a nifty read and I do recommend it, but I came away with a sense of unease about how useful the story is for others setting up Free Schools. Especially those who don’t have the same disregard for the feeling of others or a long-term love of national press embroilment. One thing Young has to his credit is that he set up a Free School. I will admit now that I haven’t. But I did write a book based on 25 years of research by the now-deceased educationalist Seymour Sarason. 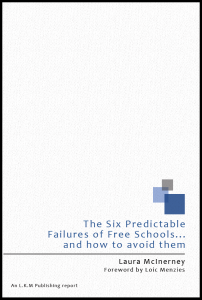 The book is called “The Six Predictable Failures of Free Schools… and how to avoid them” (available to buy here) and it uses the mistakes Sarason carefully catalogued when watching people set up many institutions and explains how to notice and avoid these mistakes in the UK Free School context. Without agenda the book gives examples of successful and not-so-successful schools and businesses and what contributed to their success. Potential applicants are free to work out what applies to them and what doesn’t, though my advice – as stated in the book – is never to believe that the history of others won’t happen to you. For history, it seems, has a horrible habit of repeating. 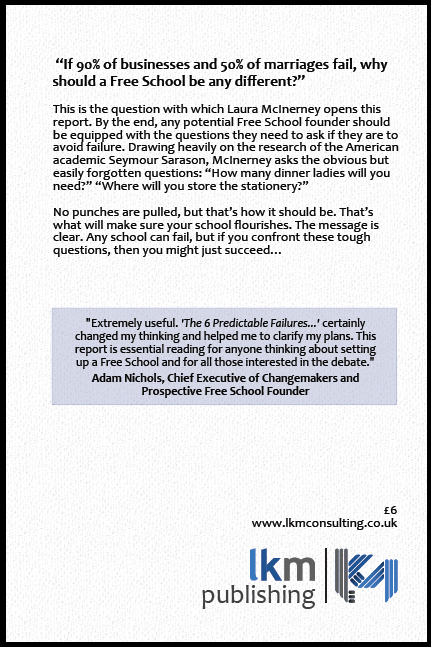 If there’s one moment that encapsulates how powerful “The Six Predictable Failures” has been, it was when I noticed it as ‘required reading’ for a workshop given by a Head I find particularly inspiring but had never had purpose to meet. Pleased but embarrassed I spoke with him and some colleagues for a few minutes during the break. 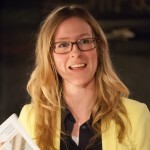 Having failed to wear my badge or properly introduce myself – (there are rather a lot of Lauras in the world!) 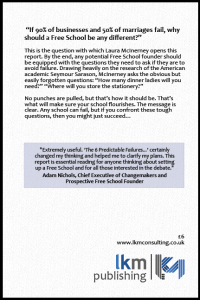 – he launched into a spiel about the importance of my book, how it had nailed his experience of opening a school and how useful he found it for explaining the process to others. Praise, from anyone, is kind; praise given so innocently is even better. It has made me certain that the book is important and I hope anyone who wants to open a school reads it, even if they disagree with it, because frank discussions about possible failure is the best way to make education policies work. Unlike Young, in my book there are no guns, no morgues, no gangsters; just useful, constructive, examples. It might not get Capote, but it is the LKMco way.